Sutro's: The Palace at Lands End | Style Weekly - Richmond, VA local news, arts, and events. This 84-minute documentary film tells the story of San Francisco's privately owned swimming, ice-skating and museum complex built in the late 19th century. Once the world's largest swimming pool establishment, the building burnt down in 1966. The ruins remain today. Journey back in time to revisit Sutro Baths when it was in full operation. See: The Seven Pools, Sutro Railway, Merry Way, Sutro's Cliff House, Ice Skating Rink, Egyptian Mummy Museum, Tom Thumb Exhibit, Musee Mecanique, Torture Museum, Lord's Last Supper, Ito, Giggling Ghost, 1963 & 1966 Fires, Sutro Ruins, and much, much more. A nostalgic trip back in time told by historians and the people that were there. 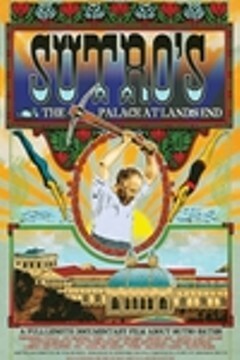 Sutro's: The Palace at Lands End is not showing in any theaters in the area.